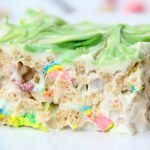 Microwave Lucky Charms Treats – Ooey, gooey marshmallowy treats that will disappear as quickly as you make them! Hey friends! I know you’ve only been hearing from me about once a week lately, but it’s because I’ve been working on a pretty big project and I can’t wait to share it with you in the upcoming weeks! I’m SUPER excited about it and it was a goal I wanted to tackle right away at the beginning of the year. So. . .stay tuned! Okay, so let’s get to the sweet stuff. Raise your hand if you’re a fan of marshmallowy rice krispie treats. Me too, especially around the holidays. In the past I’ve made heart-shaped treats, ice cream cones, turkey legs and Easter eggs out of rice krispies! 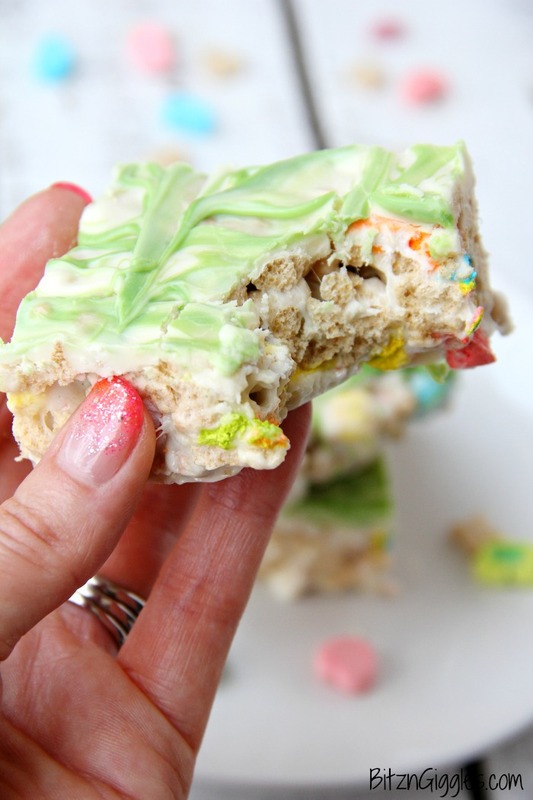 Today I’m putting another little twist on good ole’ rice krispie treats. 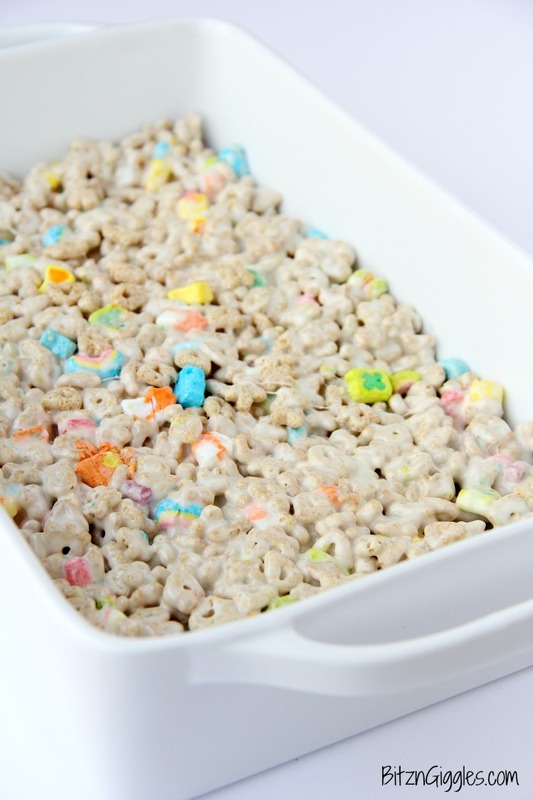 I’m making them with Lucky Charms AND there’s no oven to heat at all. You make these in the microwave! One thing you’ll never see on this blog is a mile high layer cake with intricate frosting details. That’s just not me. I have a full-time job, two kids, a husband who travels, a dog, a blog and a list of daily to-dos that can get quite long. I need to manage my time as best I can, so I choose simple, easy and delicious recipes. Can I get an amen? 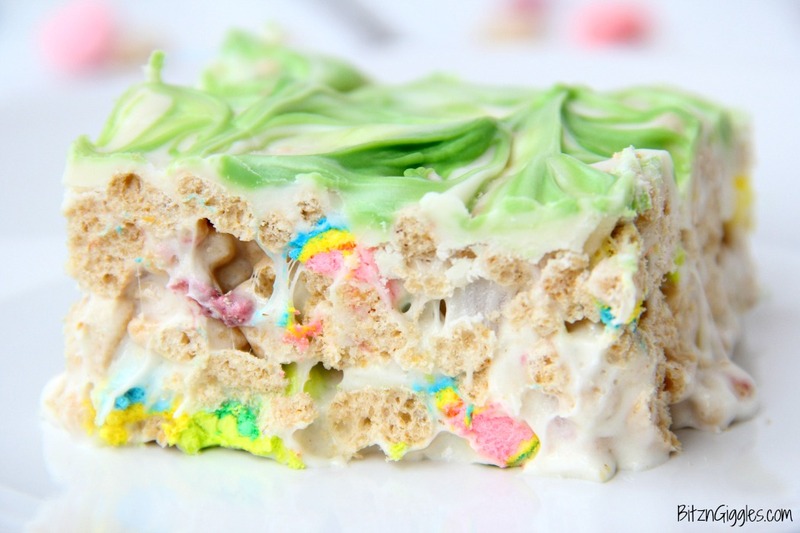 If there’s one thing I learned about marshmallows and rice krispies (or in this case, Lucky Charms) is that you’ll want a can of nonstick cooking spray nearby. 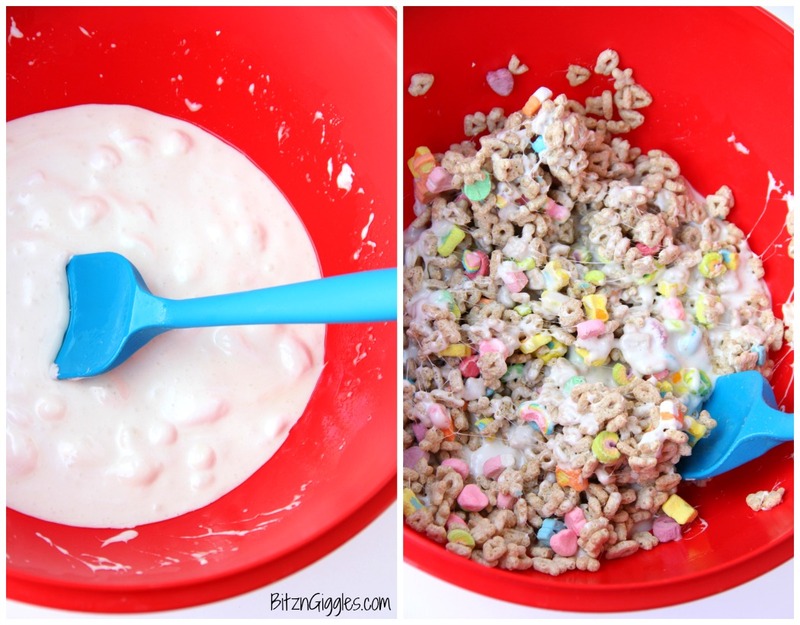 I spray the spatula that I use to mix the cereal and the marshmallows together and I also spray my hands to help press the cereal mixture into the pan. 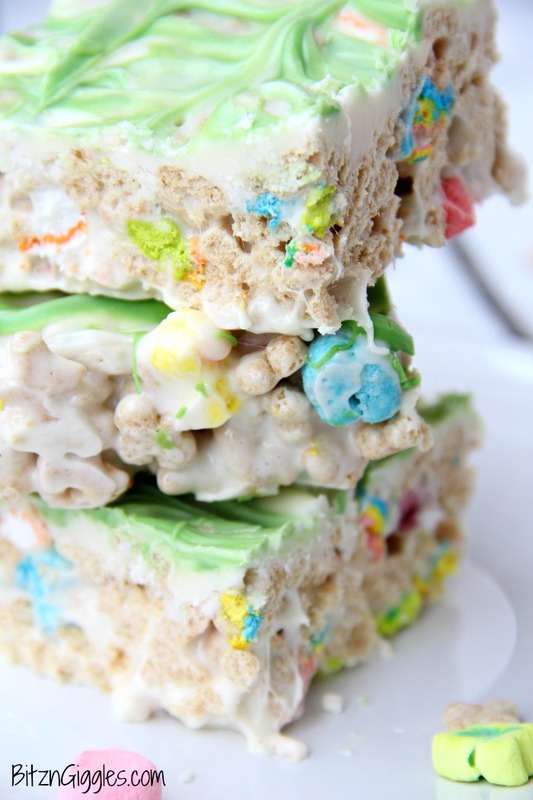 You’ll want to do the same if you don’t want globs of marshmallow and cereal stuck to everything in your kitchen. While you could just press the bars into the pan and call it a day, I will admit I do a little extra to give these treats an extra special flair (it only takes a matter of minutes, I promise). 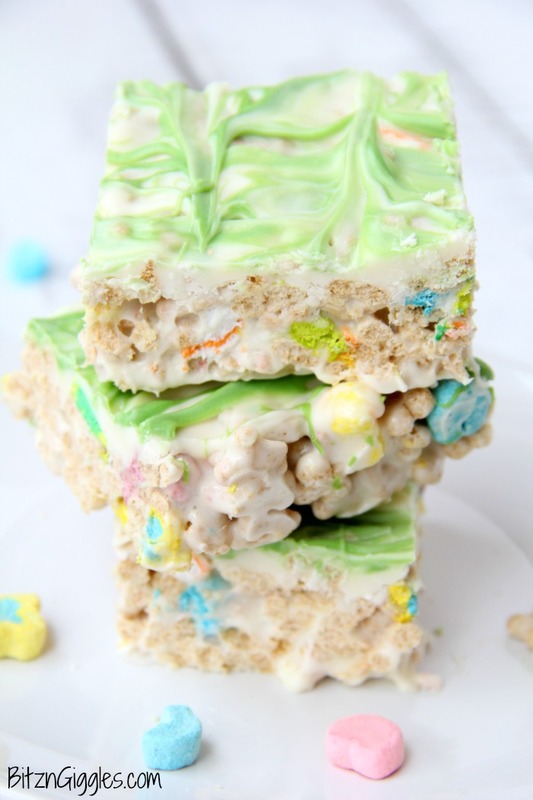 Since I’m making these treats for St. Patrick’s day, I spread some melted white candy melts on the top of the bars. 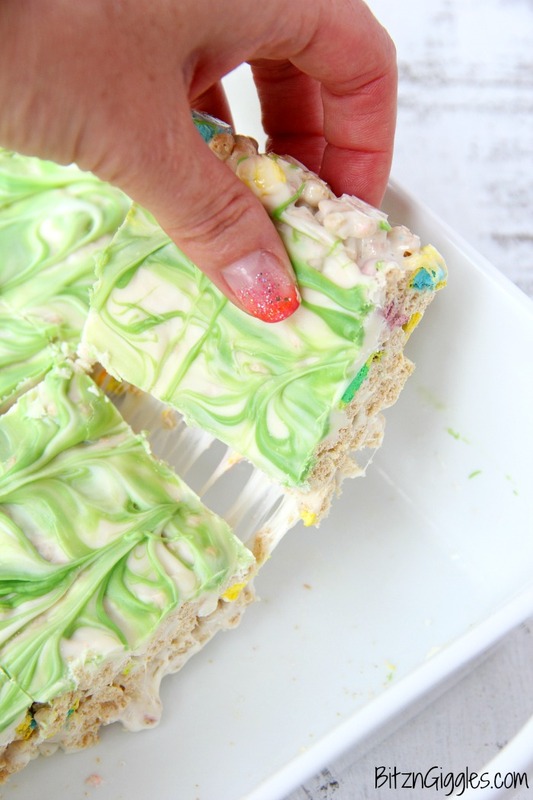 If you can’t find green candy melts, mix a couple drops of green food coloring in with some white melts and it will work just as well! I waited about 15 minutes or so and these treats were ready to be cut. And my, oh my, were they incredible. Just look at that gooey marshmallow! So, so good. I’m pretty certain these would make awesome treats for Easter, too. Yep, I’m making these for Easter. Look at those beautiful, bright marshmallows inside! I’m pretty sure these Microwave Lucky Charms Treats won’t stick around too long, but it’s just what I needed to get me through another busy week. 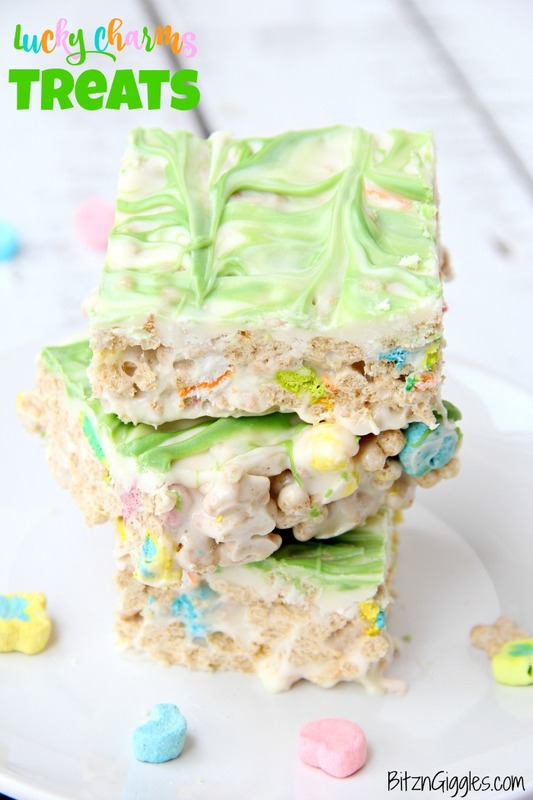 . .
Ooey, gooey, marshmallowy treats made with Lucky Charms then topped with a candy melt swirl. In a large microwaveable bowl, melt the butter on high for about 30 seconds in the microwave. Add the mini marshmallows and microwave on high for 60 seconds. Stir. Microwave another 30 seconds or until marshmallows are almost melted. Some lumps are good! Stir in the Lucky Charms cereal. 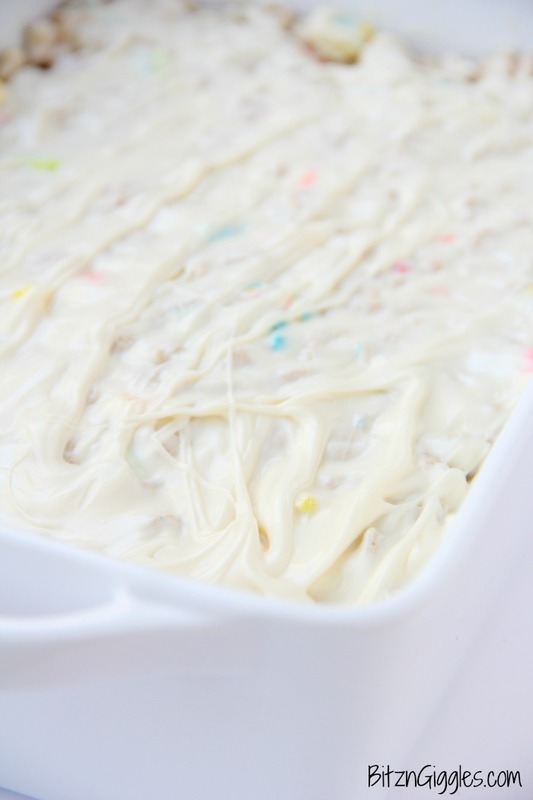 Spread into greased 13×9 inch pan with a greased spatula or your hands. Heat the white candy melts in a microwaveable bowl according to instructions on bag. Spread over the treats (the icing will be quite thin). Heat the green candy melts in a microwaveable bowl according to instructions on bag. Drop by the teaspoonful onto the treats. 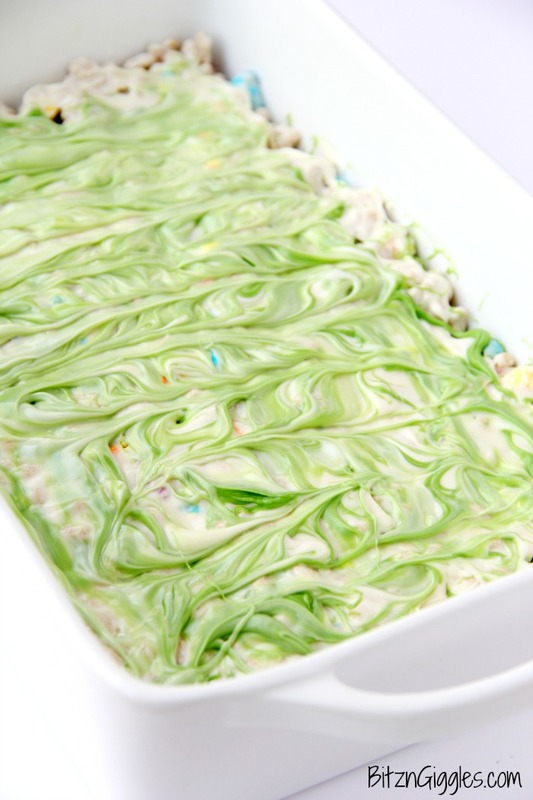 Drag a knife through the green melts to create a swirl effect. Allow to cool. Cut into squares. I hope you try them, Jo-Anne!